KP and I once, a year or two ago, attempted to write a script together. It was a story we’d stumbled upon and we both liked the idea. I’d long before wanted to work on a project with him, as a way of building teamwork between us. Even if it never went anywhere, I just wanted the challenge of doing it together. As the Gottman study I referenced in my Hindsight #2 post noted, when you and your spouse are in a “destroyer” relationship, no matter what you are doing together, you are constantly on edge, always prepared to fight and defend yourself. And unfortunately, over the years KP and I had slowly gotten ourselves into a “destroyer” relationship, so that the ability for us to work together on anything was pretty near impossible. We did not have a climate of trust when we approached shared endeavors – we were always ‘on guard’ with each other, always looking for for how the other was trying to “attack” our perspective and how we must defend ourselves against the other. Summer 2013 – heck, even Summer 2014 – if you had tried to tell me that things could turn around for KP and I and that we really and truly could get on the same page one day and work creatively together without just breaking down into disagreements, I don’t think I would’ve believed you. Sure I would have hoped that it could be possible in the future one day, but I probably wouldn’t have believed it could actually happen. I figured I was just doomed to ok-but-not-great communication in marriage for the rest of my life. But I’m here to tell you: poor communication in marriage CAN get better. The past two weeks, KP and I have worked together writing a pitch document. We wrote it once, but then were given a lot more information that helped the story, so we took another week and completely re-wrote everything. And, well, I am just so very proud of how KP and I worked together! Even a few months ago, I would have thought this was not possible for us. But I feel like both of us are equals in the process, both free to submit ideas to the other, and each be listened to and have our thoughts considered. It’s not “but that’s the line I came up with, and I think it should stay because you’re just cutting out all of my stuff” – it’s “oh, that’s a good idea I hadn’t thought of, ok let’s use your line instead“. It’s not a competition between us. We are on the same team. Working together for the same purpose. And on top of being proud of how we’re working together on this and gaining a new appreciation for my husband, I’m also really proud of what we’ve come up with. I’m very excited to see what happens from here and I’m also very excited to see how our marriage relationship will hopefully continue to grow throughout this process as a husband and wife writing team. I love this! 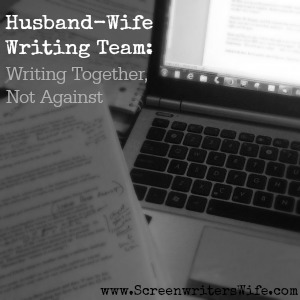 Both the story of writing the script and the story of working together with your husband! How wonderful that you were able to do this together. I know I have been guilty of being super defensive at times with my husband, and it is never productive or helpful. I came to your blog via the Edel FB page, and I’m hoping to get to meet you in Charleston! I totally get what you mean but from a slightly different perspective. My husband invented a piece of software and then decided to publish a book about it. While we had two kids already and a third on the way, this was another baby, another labor of love. I was (and still am) the board for idea bouncing, the person to say “I think that needs clarification” or “no, too many details. Take it back a step.” I was also the first round editor. It’s hard on both sides because it was my job to be critical and his job to listen to my critiques. I got really good at speaking constructively or asking questions when I wasn’t sure what he was getting at. Or (since my field is language not computer programming) being able to swallow my pride and say I completely have no idea what he’s writing about. It was a great challenge and that partnership is now one of the cornerstones of our marriage. Good luck working together! It’s possible and it will only strengthen your bond to each other. Thank you so much for commenting and sharing this perspective too! KP and I haven’t yet made it to the script phase yet, just the pitch/treatment stage, so I’m sure we will have a totally different challenge ahead of us when that happens. But yes, absolutely, I think it’s been great practice at speaking constructively to each other!